It’s been a while I’m busy preparing my “end of July release”. That release may not be the complete level 1 as expected. I have loose a lot of time and energy to try making the NSF Replayer to work without success. After that I got stuck with my Gfx converter and switched to mappy (so I needed to write the lua script to export the map and tile correctly). And then again getting problems with BG mode 3 that I decided to use. So now .. It’s the perfect time for a pre-realease. I got all I need for the score board to run and got the entire level 1 in rom and got it scrolling. The pre-release is just that… Enjoy ! The rom is available here is usual. Next step is putting the main character sprite back with all possible movement. That mean a lot of Gfx work, so I hope that it will be ready by sytart of next week. So now I can copy from anywhere in ROM to VRAM or CGRAM without any problem. 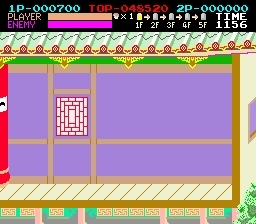 It’s now been a few days that I’m mostly playing with MAME and Gimp to rip the gfx and create the tiles to use on my Kung Fu Master port for the SNES. 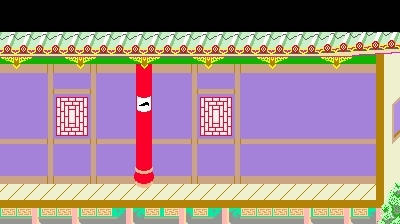 I still need to do some work in the score to create the tile and be ready to write them on the screen. I just discovered that the tool I use to convert my pcx isnt supporting big files like the one i show you here. Anybody know a good map editor compatible with the SNES ? I will anyway first concentrate on the scoring part. 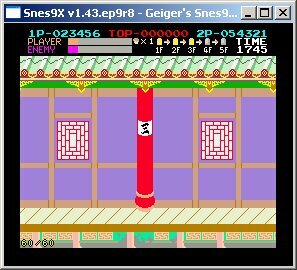 NSF Replayer status : The code is now more stable but i still have issue with the NES code that is accessing some part of memory that should remain untouched. I need to trace it more deeply … I keep you updated anyway but I will not work on that issue that much or I will never have something to show on the end of July. A received a few suggestion after yesterday post. The switching of player and ennemy life bar was causing some trouble to some of my friends, so I switched it back and changed the life counting. Here is the full screen redesign of the Level 1 start. I will now start to rip the full Level 1 gfx and start to implement the background scroll and update of the score and status. I think it can be done for start of next week. Redesigning the screen to fit. I still need to finish the map of the first level. I hope to finish that by tomorow or later if i decide to implement the score part first. The problem is when I switch the 65816 execution mode from native to emulation (6502). This code is part of a routine that is called in memory at address 7F5006 with a jsl instruction and the routine return with a rtl to code in bank 0. When I’m removing the xce instruction everything run fine, with the xce instruction the rtl return in the middle of nowhere. Is there something that xce instruction modify that I’m not aware of ? I will continue to investigate, but usual shoot your ideas in the comments section. EDIT: The problem is that when comming back emultation mode the stack address is modified. So now as a quick patch I’m saving it somewhere in RAM and restore it. Thanks D4S for spotting this. 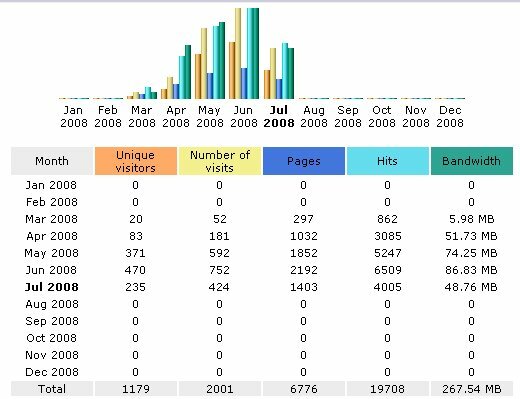 You are currently browsing the SNESDEV blog archives for July, 2008.